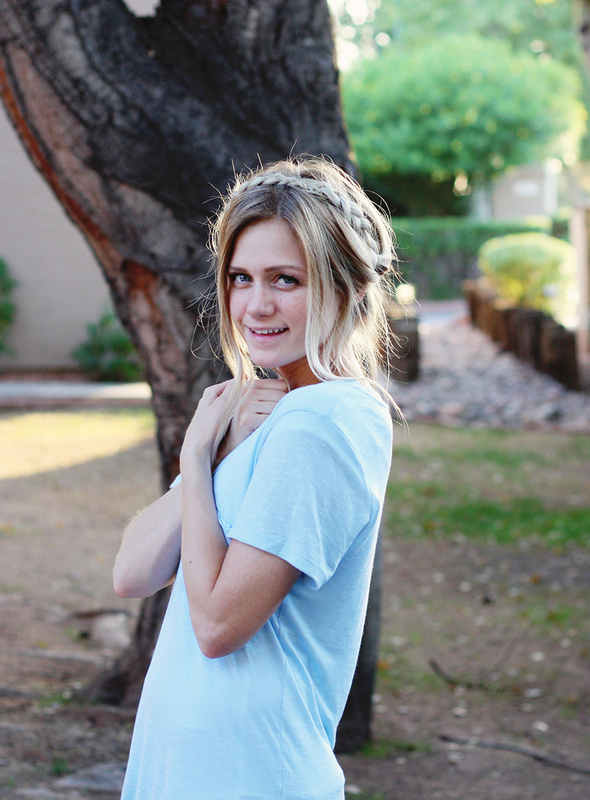 How to do the easiest crown braids ever! You guys, I told you crown braids were so so easy in this post and like 99% of the comments said something along the lines of "that looks hard!" 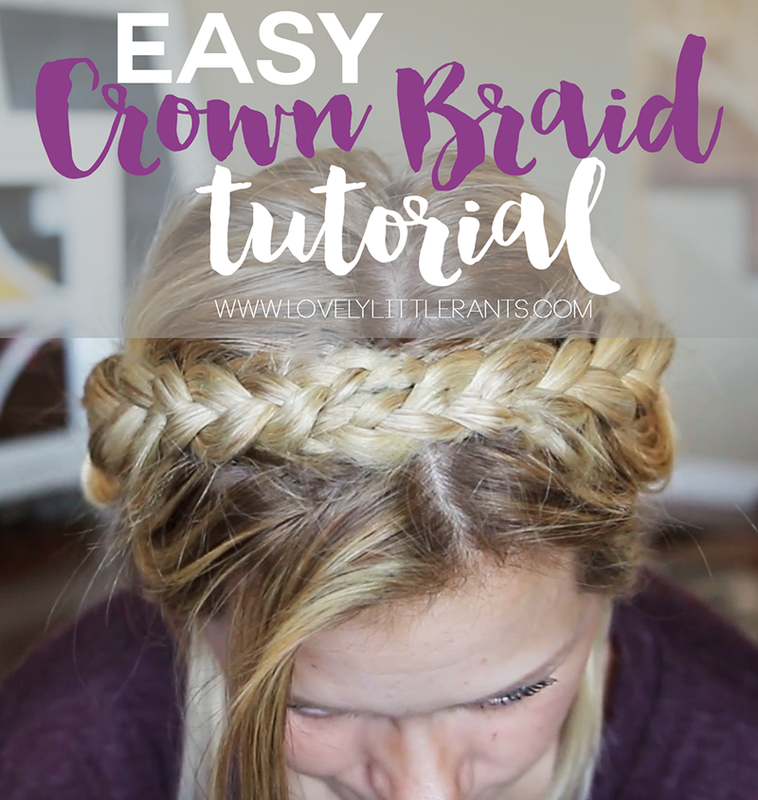 But don't even worry about it because I just went on ahead and made a tutorial to show you how easy crown braids are! Like it's almost stupid how easy they are. Once you see, you'll be like "ohhhhhhhhhhhhhh!!" and then yeah. You'll be a pro. So while making this video I was watching/listening to a Full House documentary (priorities, people) so whenever I look to the side, just know I'm actually watching Full House on my computer haha there's a little fun fact for you! Also, I only had my camera for a mirror so I fixed a couple things after this video was over, ie: bobby pin in clear view at the end, yikes. But it was fixed, don't worry bout' it. Can we all just take a second to be grateful that this week has literally flown by. Since I was out of town on Monday, I keep thinking I'm a day off (ie: I keep thinking it's Wednesday when it's actually Thursday) anyways, I just think that's great. Because on Friday, i'll be like "it's almost the weekend" and then it will already be the weekend. Does that even make since? Moral is, this week is fast and I'm all about that. A BUNCH of people keep mentioning that my hair grew like 2 feet out of nowhere! That's because it did kinda. I mentioned in this post that I got Laced clip in hair extensions! Obviously not used in this video, but just thought I would throw that out there again :) like literally 20 people at least this week have mentioned my long locks and where they came from. 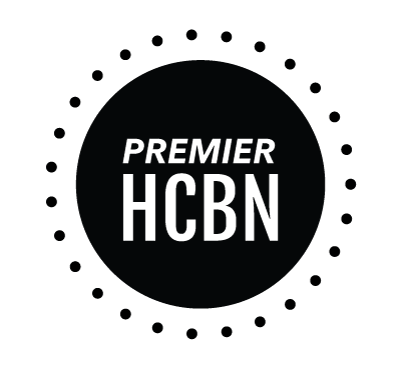 Also if you notice that little side bar guy that pops up and prompts you to subscribe to my blog is new! I want to to newsletters maybe? So please subscribe so I don't feel totally lame ;) Let me know if that pop up is annoying or if it doesn't bother you even a little or what you think! makes me want long hair again, might have to bust out the extensions! Looks so cute! I don't think my hair is long enough now, but hey it'll grow back soon enough! YAY! i was hoping to see a braid tutorial from you. I'm looking forward to giving this a try. Rocking the french braid today, and think a crown braid would be great next week. awh yay thank you!! Let me know how it works out when you do it, I bet it will look so cute!! Yes this is basically everything I want in life haha. I keep thinking, I should grow my hair out. For reasons that I want to be a Mom in three years (ish lol) and then I have a feeling shorter hair will be inevitable for the rest of my life. So we'll see how long that lasts haha. And obviously I subscribed. haha true, mom hair is usually short hair! 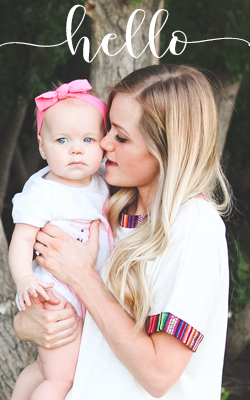 I'm determined to be a long hair mom but we will see how that goes... THANK YOU for subscribing!! Confidence boosted! haha I decided I'm not sure if I'm ready to commit to a newsletter yet so I changed it to a subscribe to follow button instead. So indecisive! I want to grow my hair out just so I can do this haha! I love it! I bet it would be so cute on you, Jen!! I am legit trying this today. Stay tuned. IT LOOKED SO PRETTY ON YOU!!! Seriously loved it!!! So glad you posted a picture!! Thanks for the tutorial! My hair is too short to do these braids, but they look lovely on you! Adorable as always! If I let my hair grow a bit longer I'll have to give it a try. Thank you so much Jess!! :) If you grow it out more and try it I want to see it!! I love the tutorials you share! Can't wait for my hair to grow out some more! Ok yay thank you so much for that feedback on the little popup! I just want to be sure I'm not annoying with it! I changed it to link to bloglovin instead because I decided I can't commit to a newsletter haha Your feedback is so so helpful!! I hope your weekend is amazing! !